Consistent, efficient and legally sound advice. The Investment Navigator is a web-based portfolio management, consulting and analysis system for commercial banks, savings banks and larger financial consultancy businesses. The Investment Navigator is integrated into your IT infrastructure entirely in line with your requirements, just like a solution you have developed yourself, and is fully matched to your content and processes (with automatic retrieval of all internal data including price feed). Over 120 different validation and plausibility-checking functions provide for almost total legal certainty when you produce your records of offers and consultations. The Investment Navigator gives you a front-end system for all adviser segments including sales management, managerial accounting, portfolio management and performance reporting. You control all adviser segments through a central analysis and administration area, thus ensuring compliance with legal frameworks and implementation of a uniform sales strategy. The presentational appearance, product selection, advisory process, documents and marketing materials are all customised to suit each adviser segment. The internationally successful CRIS software is being replaced on the German market by the Investment Navigator. 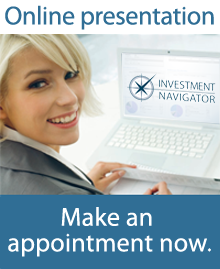 Don’t delay, make an appointment today for your online presentation of the Investment Navigator. The presentation will give you detailed insight into what our software does, and we can answer your individual questions in a chat.